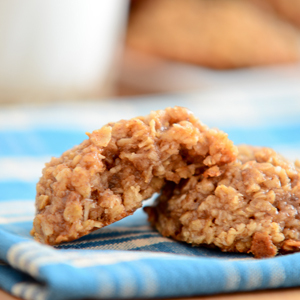 A luscious cookie that won't ruin your diet! In a small saucepan, whisk together flax and milk. Bring to boil, stirring occasionally. When mixture comes to boil, remove from heat. Set aside. Place almond butter, coconut oil, and approximately 1/4 cup of the sugar in a large mixing bowl. Mix together very well with an electric mixer. Add flax mixture, salt, and vanilla and mix. Stir in oats, coconut, and remaining sugar by hand. Mix until very thoroughly combined. Dough will be very thick. Using a cookie scoop, scoop dough onto prepared baking sheet about 2 inches apart. Bake at 325°F for 17 to 19 minutes or until very lightly browned on the bottom. You don't want them to brown too much or they will be overdone. Allow to set for about 1 minute before removing to rack to cool.